ICE HOCKEY: SOLIHULL Barons can count themselves unlucky after their winning streak was ended against Solway Sharks on Sunday night. Barons conceded in the final two minutes of the game as their mid-table rivals defeated the home side 3-2. The game’s pace was defined in the opening five minutes as Barons displayed they would be no pushovers while Sharks showed good pace following a lengthy trip down from Dumfries overnight. Sharks took the lead on seven minutes when Vaclav Kolarik raced up the ice before slotting a wrist shot past Josh Nicholls in the Barons net. 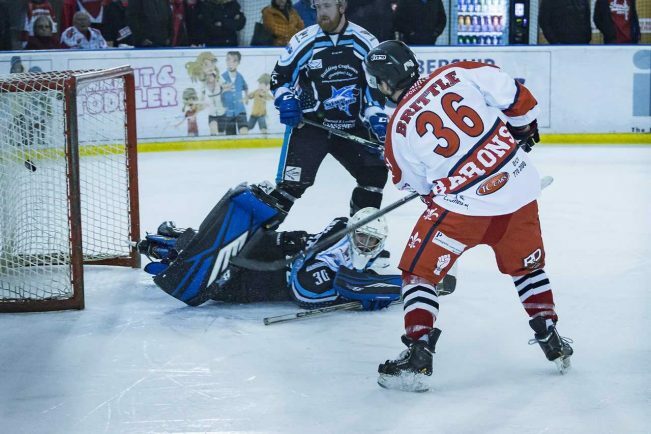 After conceding a couple of soft penalties, Barons got back on the right track as Adam Brittle stole the puck before skating the rubber into the opposition’s net with four minutes left in the opening period. A scoreless middle period saw Barons weather significant pressure from the Sharks, though Tom Soar was frustrated to see his effort fly wide of the post. Marcus Maynard got the Barons off to the best possible start in the third period when his strike handed the home side the lead within 30 seconds of the re-start. But that would be the last time Barons could celebrate as Iain Bowie’s pass found Ross Murray at the back post to level the game on 48 minutes before Sharks’ defenceman Kyle Horne struck the winning goal with a stinging shot from centre ice which slipped under Nicholls. Barons hit the road again this weekend when they travel to the Blackburn Hawks for the third of four encounters between the two teams this season. The following Saturday, Solihull head to Ice Sheffield to take on league leaders the Steeldogs while on the Sunday, December 17, they play their final game before Christmas when they welcome the Billingham Stars to Hobs Moat. Adam Brittle gets the Barons opening goal on Sunday night. Picture: Steve Crampton.